A rare frog believed to be found only in a specific part of the Anamudi summit in Eravikulam National Park in the Indian state of Kerala has been spotted from Poovar, a part of Western Ghats hill ranges some 20 kilometers away from the place of its earlier report. According to a research correspondence published in the latest issue of the Journal of Threatened Taxa, the new record is approximately 20 kilometer away from the peak in the in north east direction, but within the boundary of the same national park. The researchers have made an unexpected confrontation with the frog during the survey of the endangered Nilgiri Tahr (Nilgiritragus hylocrius) present in Eravikulam National Park. Known as Resplendent Bush Frog, (Raorchestes resplendens), the rare frog is categorized as critically endangered by IUCN Amphibian Specialist Group. It was first reported in 2010 by a team of researchers including the famous batrachologist Biju from Anamudi peak, which is the highest peak in the state of Kerala. The elusive frog which has brightly colored reddish orange upper side was found in the grass land region in Poovar which is similar to the habitat from which it was first found. According to the correspondence, the frog was spotted inside a grass clump. The new finding important as it gives valuable information about the range of distribution of the species, which is significant in the conservation of the species. 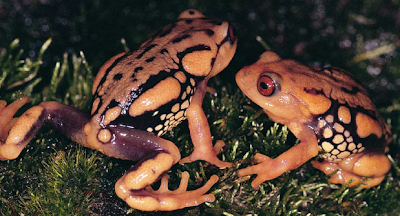 When the frog was first found and described, it was believed that it had a very restricted presence and is found only within a 3 square kilometer area. However, the new finding reveals that the range of distribution of the frog is actually more than 3 square kilometers. “It is likely that R. resplensens may be more widespread in the high altitude primary grasslands of Eravikulam National Park and surrounding areas of the Western Ghats, than it was earlier thought.”, says the correspondence. In 2010, when it was first spotted, researchers searched in nearby places, but failed to find the frog from different habitats in the vicinity. This has made them believe that the frog is present in only one type of locality in a small range. In the present spotting, the most adjacent shola forest patch was one kilometer away, which means that the frogs may be living in the grass land itself. However, the first observations on Resplendent Bush Frog have revealed that the frogs use bamboo thickets in the vicinity to burrow their eggs. Thus the grassland sholas and related bamboo thickets at Eravikulam may be significant in a conservation perspective. When it was first found in 2010, it was named Raorchestes to honour C. R. Narayan Rao, a pioneering batrachologist in India. The resplendens name was given for the splendid colour of the frog. According to researchers, this rare frog is notable for its color as well as short limbs also.